Neon Flash Spirea, spiraea japonica 'Neon Flash', is a 3 foot by 3 foot compact plant that is a fast grower with "flashy" bright red flower clusters blooming throughout the summer season. The dark green summer foliage emerges with a purplish tinge, and then in fall becomes a dark burgundy. Spireas are among the easiest flowering shrubs to grow since they are tolerant of many soils except extremely wet. The plant also likes mulch and summer watering, along with full sun. Neon Flash has a dense mounding habit that is tidy and versatile, with high tolerance for snow damage. 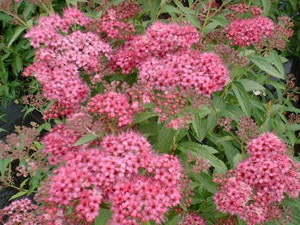 Incredible color in both foliage and flowers, this spirea deserves a place in any garden.